About 15 years ago, Rotarian and former Loudoun County Circuit Court Judge Tom Horne had a vision for a community outreach program related to law. The camp was established to give rising seniors a glimpse of the judicial system. 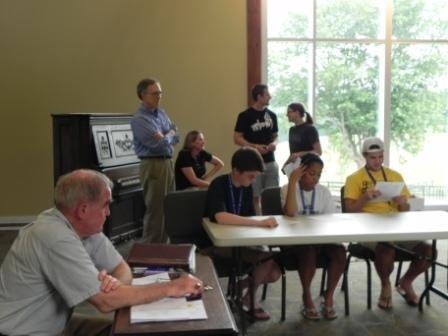 Since its inception, The Rotary Club of Leesburg has supported the annual Law Camp with a picnic. Approximately two dozen youth from Loudoun and Fauquier County high schools were introduced to Rotarians and fed hot dogs and hamburgers at a cook-out on Tuesday evening, Eleven Rotarians including Tom Horne, President Chuck Reavis, Ron Rogos, Tom Gates, Jake Jacobson, Jaro Vitaska, Tony Aiken, Valerie Beaudoin, Michelle Martinson, Pam Banks, and Judy Smith were joined by Rachel Veal to serve the students and their attorney/camp chaperones Robin and Carly.